Deede Uche's World: A BEAUTIFUL ORNAMENTAL PLANT, BUT VERY DANGEROUS! A BEAUTIFUL ORNAMENTAL PLANT, BUT VERY DANGEROUS! If you have this plant, get rid of it please. It is very common in our houses, gardens, parks and offices (popular as indoor & outdoor plant). 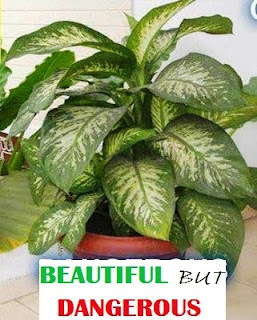 Known as the DUMB CANE or DIEFFENBACHIA, it is now proven to be dangerous. I personally toyed with it as a child, and I have not forgotten the experience. I ate it mockingly as sugar-cane. I had a swollen tongue, and experienced severe itching from my lips and tongue down to my throat, and all over my body that came in contact with the sap. It was a large intake of red oil that saved me. So please, take note! The leaf is known to cause itching if its sap (milk) touches the skin. But there are more dangerous facts! A child put a piece of the leaf of this plant in her mouth, and her tongue swelled to the point of suffocation. There are also other species with the same characteristics of coloring. Those are also poisonous and we should get rid of them. Please watch out for our children. As we all leave our children at home in the hands of house-helps, we should give them a safe environment where they can play. This plant is a deadly poison, especially for the children. It can kill a kid in less than a minute and an adult in 15 minutes. It should be uprooted from gardens and taken out of offices. If touched, one should never touch the eyes; it can cause partial or permanent blindness.